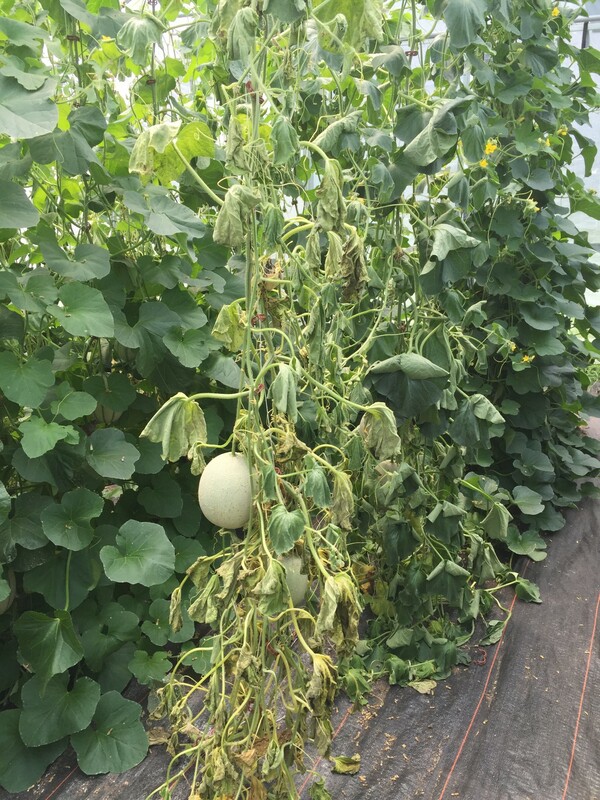 In issue 619 of the Vegetable Crops Hotline newsletter I reported that during April 2016 research focusing on the development of a unique market segment for Indiana melon growers was initiated. The research aims to demonstrate that through the use of high tunnels or greenhouses growers will be able to market melons earlier and increase yield while keeping quality undeniably high. Initial research focused on variety evaluation in a soil and soilless production system in high tunnels and a greenhouse, where the plants were trellised vertically. In the long term, we aim to establish the best production practices for high tunnel and greenhouse growers in Indiana and we will do a complete life cycle analysis to determine the profitability of the proposed production systems. Well it sounds all easy to do, but in reality I have experienced several production related issues during the growing season. Let me present to you some details about the research. 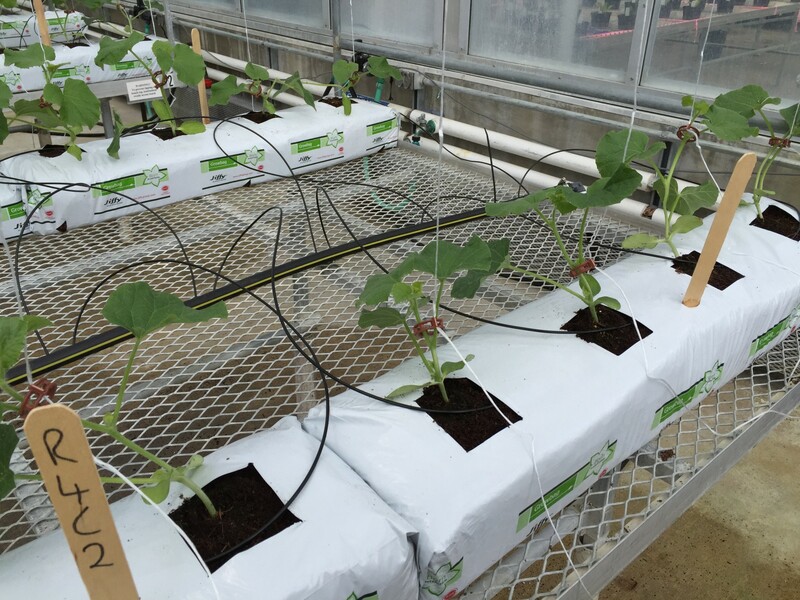 During late April and early May 2016 eight melon varieties were planted at the HLA Plant Growth Facility (HGRH) on campus (greenhouse), at Meig’s Farm, which is part of the Throckmorton Purdue Agriculture Center (24’ x 48’ high tunnel), and at the Purdue Student Farm (30’ x 96’ high tunnel). Eight varieties, of which six have never been grown before in the U.S., were evaluated. 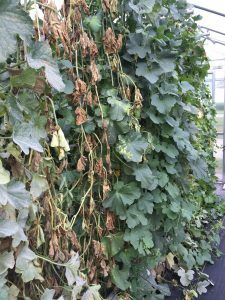 Varieties included Sephia and Migdal (Galia types), Magnificenza and Tirreno (Italian netted cantaloupe), Kenza (Charentais), Karameza (long shelf life, fully netted cantaloupe), and Rawan and Rowena (Ananas type). Enza Zaden provided germplasm for the variety trial. On campus and at Meig’s Farm plants were grown with hydroponic techniques in soilless medium culture using coconut coir as substrate. At the Student Farm plants were grown in the soil. All planting rows were orientated east-west. 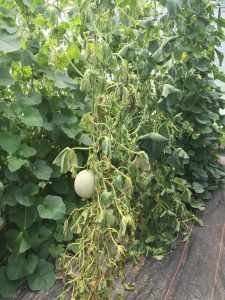 Plant nutrition: Melons planted at the Student Farm were only fertilized pre-plant with Greenkeeper’s Secret 32-0-5 Jumpstart (100 lb per acre N). Melons grown in the HLA greenhouse were irrigated throughout the growing season with a nutrient solution that consisted of 148 ppm N, 23 ppm P, 104 ppm K, 141 ppm Ca, 49 ppm Mg, and 86 ppm S, and the EC was 2 mS.cm-1 and pH 5.8. Melons produced at the Meig’s Farm were irrigated for the first five weeks with a nutrient solution that consisted of 143 ppm N, 48 ppm P, 217 ppm K, 194 ppm Ca, 59 ppm Mg, and 131 ppm S. The nutrient solution EC was between 2.0 – 2.2 mS.cm-1 and the pH 6 – 6.5. From week six onwards the nutrient solution was adjusted to an EC of 2.4 mS.cm-1. During that period the nutrient solution consisted of 160 ppm N, 60 ppm P, 271 ppm K, 199 ppm Ca, 67 ppm Mg, and 162 ppm S.
Plant husbandry: All plants were trellised vertically 8 feet high, and all lateral shoots were removed by hand from the bottom up on the first 18 inches of main stem growth. All tendrils were removed. Laterals that developed from other nodes were left until it could be confirmed that fruit set has occurred. Laterals were then removed in order to have fruit develop on laterals growing from every second node. Fruit development is limited to one fruit per lateral. The lateral shoot was terminated two leaves from the developing fruit. Bumblebees (from Koppert Biological Systems) were used for pollination. The Meig’s Farm planting was done 12 and 14 days after the HGRH and Student farm plantings, respectively. This was due to a delay in equipment installation. The seedlings were therefore already 12-18” long. The Student farm trial was planted first, and due to too low soil temperature initial growth was slow and some of the transplanted seedlings developed Damping-Off (Pythium sp./spp.). Plants produced in the soilless substrate was not affected. At Meig’s Farm we had several irrigation issues. Chemilizer® water powered fertilizer injection pumps were used to inject the concentrated citric acid (Growth Products), and 5-11-26 (Peters Professional) and 15.5-0-0 (Jack’s Professional) fertilizer. On three occasions the pumps malfunctioned which meant that the EC and pH levels required could not be maintained at all times. A water supply issue was also experienced during the early stages of anthesis and fruit set. This resulted in the abortion of female and male flowers, and fruit that has already been set. The role-up windows of the high tunnels at the Student Farm and at Meig’s Farm were covered with an insect screen (Econet 100400, Svensson), but somehow the spotted and striped cucumber beetles were still able to enter the growing area. The Student Farm melon planting was first affected by the beetles (late May). At Meig’s Farm beetles were first observed during the second week of June. The beetles did transmit bacterial wilt which affected the crop at a later stage. The beetles did show a preference for Sephia (worst affected), Migdal and Kenza. The least affected varieties were Rowena, Magnificenza, Karameza and Rawan. Sephia was also the worst effected by bacterial wilt, followed by Rawan, Migdal, Tirreno and Kenza. Rowena, Magnificenza and Karameza was the least affected. The HGRH trial was not affected. During anthesis, especially in the HLA greenhouse, many flowers were pollinated by the bumblebees but several developing fruit aborted a few days after fruit set. This did occur at the Student Farm and Meig’s Farm as well and might be due to the high humidity and temperature in the high tunnels and greenhouse. This might have been exacerbated by the high planting densities used. The varieties selected for these trials had intermediate resistance to powdery mildew (Px: 1,2,5). However all varieties, excluding Sephia and Rowena, were severely affected by powdery mildew. Sephia and Rowena showed no symptoms of infection. The application of fungicides were purposefully withheld to evaluate the intermediate resistance of the varieties to powdery mildew. In the next issue I will present a short summary of some of the yield and quality data.